Verreaux’s Eagle, Black Eagle (old name), ukhozi (Zulu), witkruisarend (Afr. ), ntsu (Sotho). The scientific name of the genus ‘Aquila’ is the Latin word for eagle, and the species name ‘verreauxii’ was derived from the 18th century naturalist, Jules Verreaux from France, who visited southern Africa in the first half of the eighteenth century (Steyn 1982). Verreaux’s Eagle is a large bird of prey that is highly specialised, with its life history and distribution revolving around its main prey of rock hyraxes and preferred habitat of hilly and mountainous terrain. It is wide spread throughout Africa and occurs as far north as Eritrea and as far south as South Africa. It feeds primarily on rock hyraxes but it also preys on other animals such as small mammals, birds and reptiles. Its populations are stable and have been less impacted by human encroachment due to the isolation and the inaccessible terrain of its habitat. It is currently listed as ‘Least Concern’ by the IUCN Red list. When perched or at rest adult Verreaux’s Eagles are entirely black in appearance, except for a white ‘V’ above the wings on the back and yellow feet/talons and cere (waxy layer covering the base of the upper beak). In flight, the unfolded wings expose a white rump and whitish panels on the outer wings. The wings have a distinctive shape that is broad in the middle and tapering at the tips. Sexes are similar, but females are slightly larger than males. Juveniles have a yellow-brown plumage and the head and back of the neck have a distinctive reddish-brown colour. The face and throat are black. Juveniles achieve adult plumage in 4 years. Verreaux’s Eagles are often found in pairs, perched on a prominent lookout or soaring and gliding around hilly and mountainous terrain. The shape of their wings facilitates gliding up drafts created when wind strikes mountain cliffs and this allows the birds to stay airborne for long periods or travel great distances. Unlike other birds, they are able to fly into strong winds and still maintain aerial control. Verreaux’s Eagle adults are not vocal, they seldom call as they rely more on visual communication. However, the young are very vocal and continuously call out for food and protection whenever the parents are in sight. The call of the young eagle is characterised by a penetrating yieup-yieup–yieup. The distribution of Verreaux’s Eagle is strongly linked with that of its main prey of rock hyraxes and areas with hilly and mountainous terrain. In Africa, they occur as far north as Eritrea and Ethiopia and south into South Africa. In South Africa they occur throughout the country in areas with suitable habitat. 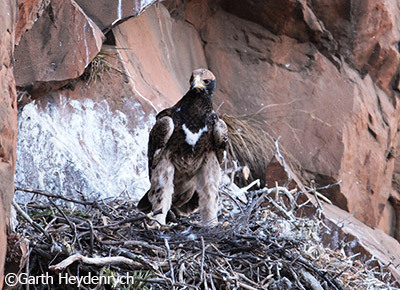 Verreaux’s Eagles are habitat specific and occur in hilly and mountainous terrain with cliffs, rocks ledges and caves. They are known to occur in dry savannah, woodland, desert and high rainfall areas and wherever rocky outcrops, gorges or mountain ranges provide nesting sites and prey. Hyraxes, which share the Verreaux’s Eagle’s mountainous habitat, are the eagle’s main and often only prey; but the eagles are also known to eat small mammals, birds, eggs and reptiles. In places like the Walter Sisulu National Botanical Garden, where there has been a decline in the rock hyrax (Procavia capensis) population, Verreaux’s Eagles feed on fowl, cane rats and scrub hares. They can also feed on small livestock like lambs and goats if accessible. Verreaux’s Eagles breed with one partner for their entire life, and only replace a partner in the event of death. Mating takes place all year round and egg-laying season is between April and July. Verreaux’s Eagles produce one to two eggs per clutch. Incubation lasts 38–41 days and is done by the female while the male provides food. In cases where two eggs are laid, the eggs usually hatch about four days apart. The older chick will normally attack and harass the younger chick until it dies. It is for this reason that Verreaux’s Eagles rarely raise two chicks despite laying two eggs. The surviving chick leaves the nest after 12 weeks and is forced out of the territory by the parents. 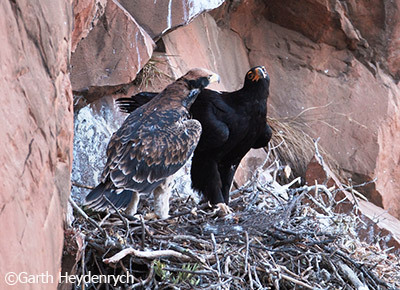 Verreaux’s Eagles pair for life, therefore bonding plays a significant role in their daily lives. Often they can be observed perching, preening and flying together in perfect unison. Preening is done daily, as oil is released from the green gland at the base of the tail, and spread over the rest of the feathers to keep them supple, waterproof and in good condition. The large feathers are preened by passing them through the beak, one at a time, from the base of the feather to the tip. Mating outside the breeding season is considered pair bonding. Nest building is done by both sexes by collecting branches and sticks. It has been observed at the Walter Sisulu National Botanical Garden that smaller sticks are brought to the nest at the end of March, and by April, leafy green sprays are taken to the nest. This is a sure sign that egg-laying is imminent. 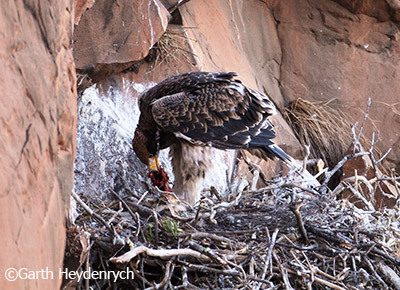 The sprays are mainly from the mountain karee (Searsia leptodictya), as they have a disinfectant property that keeps the nest free of disease once the eaglet has hatched and prey is being brought to the nest. The mountain cabbage tree (Cussonia paniculata) is also used to line the nest. The pair is often seen flying together and they probably hunt in pairs, where one distracts the prey and the other one attacks. 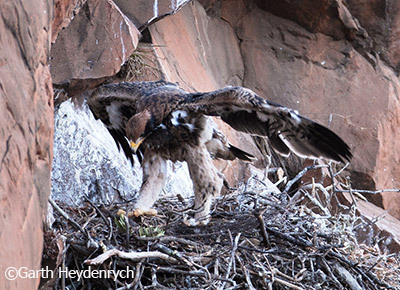 Nests are built on rock faces and cliffs to minimise nest predation. Verreaux’s Eagles are top predators in the ecosystems where they occur and they play an important role in maintaining ecosystem health. For example, in farming areas they control the populations of hyraxes and prevent possible competition with livestock for grazing. The species is locally persecuted in southern Africa where it coincides with livestock farms through poisoning and hunting. However because Verreaux’s Eagles only take live prey and not carrion, and they normally occur in rugged terrain that is not easily accessible, hunting and poisoning have had minimal impact on population numbers. In areas where hyraxes are hunted for food and skins, eagle populations have declined due to declining prey populations. Possible future threats include habitat overlap with wind farms that are likely to be placed windward of areas such as mountain ridges. This species has an extremely large range, a stable and moderate to large population and is therefore considered to be of Least Concern on the IUCN Red List. The genus Aquila is comprised of 11 known species, of which the Verreaux’s Eagle is closely related to the Golden Eagle (Aquila chrysaetos), Gurney’s Eagle (A. gurneyi), Wedge-tailed Eagle (A. audax), Bonelli’s Eagle (A. fasciatus) and the African Hawk Eagle (A. spilogaster) based on DNA data. Gargett, V. 1990. The Black Eagle. Acorn Book CC. Randburg.Pickford, P & B. 1989. Southern African Birds of Prey. Struik Publishers. Cape Town. Kemp, A. & M. 1998. Birds of Prey of Africa and its Islands. New Holland Publishers (UK) Ltd, Cape Town.Helbig A.J., Kocum A., Seibold I., Braun MJ. 2005. A multi-gene phylogeny of aquiline eagles (Aves: Accipitriformes) reveals extensive paraphyly at the genus level. Molecular Phylogenetics and Evolution 35: 147–164.